‘Sir: I am not a medical man, but….’: Laypeople and Medical Journals in the Nineteenth Century. For many medical historians, including myself, medical periodicals are a resource of critical importance. With lively news and correspondence sections, case reports and editorials, they are a rich source of information about medical encounters, innovations, individuals and debates. In the nineteenth century, journals were also an important tool in aiding medical practitioners in their push for professionalization. As Michael Brown has persuasively argued, they were a ‘technology of imagination’, allowing practitioners to collectively project their professional cohesiveness. Periodicals like The Lancet and the British Medical Journal were constructed to be mediums of professional politics, agitating for medical reform in the early part of the century, and offering opinions on a myriad of issues, from public health to doctors’ fees to the question of whether women should be allowed to join the ranks of the profession. Fig. 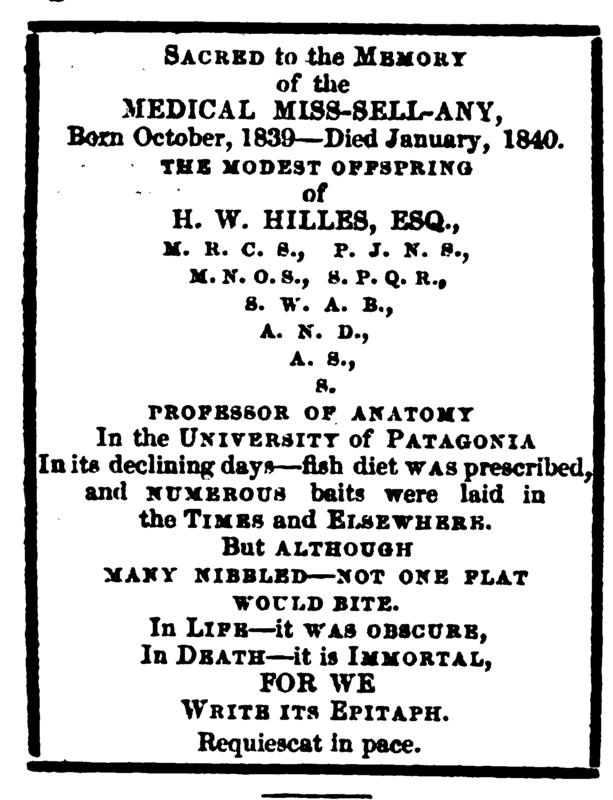 1 In 1840 The Medical Times published this mock obituary for rival journal, The Medical Miscellany. While it’s difficult to know the extent of the journal’s lay audience, it’s certainly the case that throughout the nineteenth century, The Lancet published many letters from lay correspondents. Of course such correspondence was mediated and governed through the journal, which ultimately had the profession’s interests at heart. But within its pages we also find a rich variety of contributions from those outside of it: notes reporting unusual symptoms correspondents had experienced, reports of unseemly advertising by quack doctors and theories regarding the benefits of temperance, to name just a few. ‘You are aware, and are doubtless proud to be aware, that THE LANCET is read not only by the medical profession but by a large number of educated laymen’ wrote one correspondent in 1899. As the century wore on The Lancet became increasingly cautious about reaching out to the public, fearing that an excess of medical knowledge could lead to self-doctoring. But that laypeople formed part of their audience, and that news from their pages was often reprinted in the non-medical press, meant that those writing for medical weeklies were acutely aware that the eyes of the public were trained upon their words. Print culture enabled a permeation of boundaries, and a community of readers beyond the profession. Because of their popularity then and presence today, The Lancet and British Medical Journal continue to dominate histories of medical journals. Yet during the nineteenth century, the spectrum of periodicals was vast. Moving beyond the medical weeklies, periodicals focused upon homoeopathy, first-aid, microscopy, public health and the anti-vaccination movement all provided even greater opportunities for non-medical professionals to engage with the circulation of medical knowledge, something which I hope to investigate further. As valuable as they are as resources for all kinds of historical research, medical journals also have their own history and one which warrants much greater attention. Michael Brown ‘Medicine , Reform and the ‘ End ’ of Charity in Early Nineteenth-Century England’, English Historical Review CXXIV:511 (2009), 1353–88. For more on Wakley’s political motivations see Michael Brown ‘”Bats, Rats and Barristers”: The Lancet, Libel and the Radical Stylistics of Early Nineteenth-Century English Medicine’, Social History, 39:2 (2014), 189-209. ‘Preface’ The Lancet, 1:1 (October 5th 1823), 1-2. Alexander Paul ‘Vaccination Statistics: A Question of Arithmetic’ The Lancet, 154:3976 (November 11th 1899), 1330-1.